Being a dedicated marathon runner, sport in general and running in particular have helped me to establish contact with people in most of the places where I have been, and to bring me to many of these places. My work in 2010 and 2011 as a coach of a group of distance athletes in Laos (and an Australian runner and vet that joined the squad there) have ended by bringing me to Darwin, in Australia. But the true is that at this moment I live here, where I work as a development officer of Athletics Northern Territory. Of course Australia is not what many would denominate a ‘developing country’ and the situation here is obviously very different to that where I have worked in the past. But given the relative low amount of people doing athletics in the territory, and the isolation in which many rural communities live in this part of the world, this job has many similitude with previous jobs in the development sector. And at the end of the day, sport is one of the most powerful tools to boost personal and community development, isn’t it? Athletics Play and Active After School Activities designed to teach of the skills of running, jumping and throwing through organised play and game based experiences and aiming to bring excitement into playing athletics. The Development and Academy Squads, which are designed to recognise and select athletes with talent and potential in the sport and to support them and their coaches in their future development in athletics by organizing activities that include specific coaching clinics, workshops, training camps and assistance in the participation at Athletic events such as Australian All School Track & Field Championships, Australian Junior Track & Field Championships and Australian under 23 Track & Field Championships. Sounds professional, doesn’t it? Well, my real deep motivation is to introduce kids in the territory to athletics, that they enjoy it and that it contributes positively to their personal development. The Northern Territory is huge (1,349,129 square kilometers), and getting to the different sites with associated clubs or where to implement this program is not easy. The vibrant capital city of Darwin, which has been hand-picked by Lonely Planet as one of the world’s top 10 cities to visit in 2012 is closer to Asia than any other capital city in Australia. And, Alice Springs, which has two club in the association, is on a 2 hour plane ride from Darwin. Other places that I will have to visit are Kathrine (just three hours ride from home) and Arnhem Land, which is located in the north-eastern corner of the territory and is around 500 km from Darwin. During my time in Peru, some young runners I trained with gave the nickname of ‘padrino rapido’ (fast godfather). But given the legend of the Flying Dutchman (a ghost ship that can never make port) looks like the story of my life (I also seem doomed to sail over the oceans forever) and that I may need to fly to do part of my job, I think soon I will get the nickname of flying coach-man (the name of Arnhem Land comes from how the explorer Matthew Flinders named the region after the Dutch ship Arnhem). 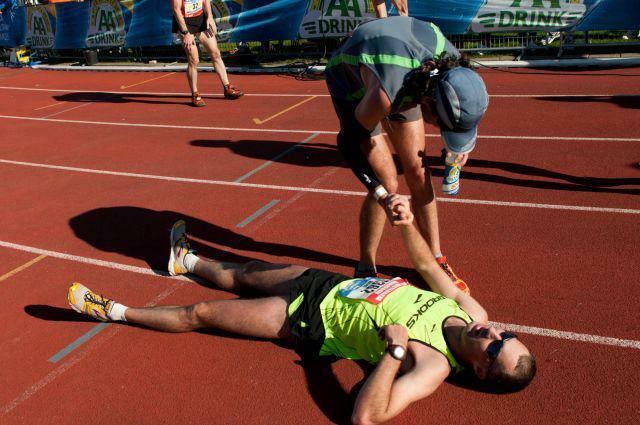 By the way, and three weeks already after the Marathon of Amsterdam, I do not feel rapido or flying at all!! Sixth months, thirty eight greenhouses and three pairs of running shoes later, I am entering my last week in the region of Cuzco. One of the first impressions that I got when I arrived here is that young people are forced to leave their communities, their customs, and their families looking for a modern life and end up in between two lifestyles, two different cultures and philosophies that are increasingly separate and in which one is overpowering the other without mercy. 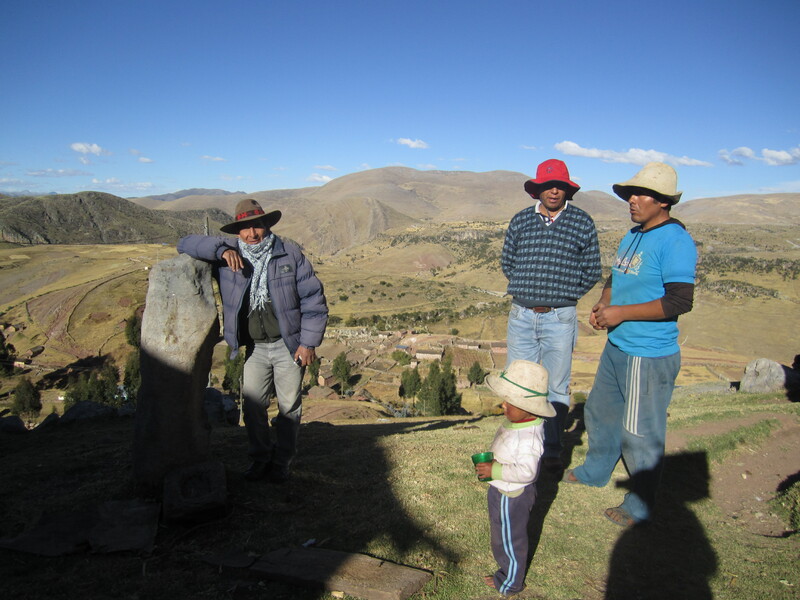 In Andean communities of Peru elderly people are often known as “yachaq”, wise people. Listening to one of these “yachaq” is a good way to understand better the dilemmas that young people in these communities face: to stay in the communities and live as their ancestors did or to join the process of mass migration to cities and new mining areas that are being installed in many communities in search of a better and modern life. “May be because of the lack of opportunities or may because money means so much for the younger generations, the truth is that young people do not find enough here and many abandon their communities and their customs”. The model of Western life, in which supposedly everybody has enough, is “an invitation to stop being what they are and go in search of something they want to be. It is like they dreamed of being different and “modern”, and decide to leave everything and live a life of fiction which does not become fully modern and where they end up losing part of their identity”. Mining companies play an important role in this dream. All mining companies have something in common when they visit the communities for the first time: they all promise a higher salary and better living conditions than their current life. But once young people reach the mining camp, the reality seems to be different and many of the promises are just words. Yet, many of these young people will adapt to working long hours away from their families and culture. The consequence is that many communities are inhabited only by the elderly and some pastoralist children that take care of the few animals they have left (in a previous post I wrote already about why children here spend less time in the schools than they should). These inhabitants, their animals and the plants they eat seek favorable conditions to survive a climate change that increasingly affects them more strongly. Under these circumstances I often wonder whether it makes much sense to keep trying to maintain some of these communities alive, or whether it would be better to relocate these communities in areas with better services, with at least medical care and well-functioning schools. According to the “yachaq” I was talking with, development projects should try both and let people decide. Soon I will migrate as well, but her advise will last in my mind, as long as I hope that the greenhouses will last. Hasta pronto hermanos. It was sunny Sunday afternoon yesterday in Cuzco. 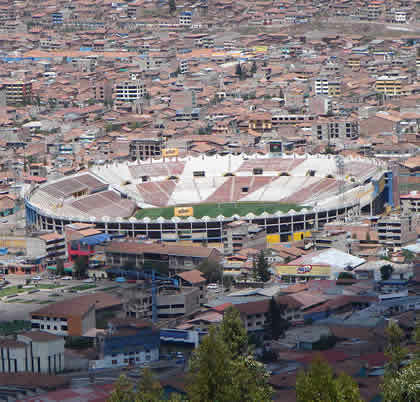 After the hills training session in the morning in Sacsayhuaman, and a cup of coffee at Plazoleta San Blas, I thought that watching a football match at the Garcilaso Stadium of Cuzco would be the best way to spend the last hours of the Easter Holidays. One of the local teams, Deportivo Garcilaso played the Peruvian Cup against the youth team of the biggest team in the city Cienciano. Only five nuevos soles (approx. 2 US$) and I could be entertained for two hours while sun bathing on one of the grades of the stadium. I chose the side of the supporters of Cienciano hoping that, because it is the youth team, I could share the afternoon with enthusiast relatives of the young talents. I also expected less people on that side, waht would make my afternoon even more relax. But like the project I work for, the reality is not exactly the plan. Just 20 meters from me there were two men shouting racist comments against the number 17 of Deportivo Garcilaso, a strong right back defender. Like these two men, he has two legs, two arms, but you can imagine he is black, what for some people (like these two stupid men) may be a reason to be insulted. I let 10 minutes pass by, but I could not resisit it any longer so I addressed one of these two men. I also asked a police man to intervene, instead of laughing their “jokes” and participate of the racist shouts from time to time. Apparently nobody in my surrounding (except a second police man of the 5 that were following the match there) seemed t0 share my frustration. If I did not know about sports I could just go to the other side of the stadium. I felt really incapable; was I the stupid white man who does noet want to understand and integrate into the local culture? I also thought of the many Peruvians around the world that must suffer discrimination in other places of the world. How would they feel if someone in Germany called their national star Claudio Pizarro Indio or chicha? I am also sure that these two men and the policeman would love to have an autograph of their other star Jefferson Farfan, a black Peruvian that sport has helped to escape of poverty. I left the stadium angry and thinking that, may be, instead of growing vegetables and building greenhouses I should do something about values and education. Or use that big fields in the stadium to grow vegetables? (read a past related post here). It is short after midday; we have just had lunch in Ccapi and we travel by car towards Uyllullo, one of the two rural communities of this district where Chakana implements a food security project. It is my first visit to the field since I arrived to Cuzco two weeks ago, and in my mind it is the preoccupation of whether we will finish the project in the decided terms, perhaps because it is my main responsibility, but mainly because it is necessary that things come out well for this Andean community, far located from the rest of the world. Watching at the deep cliffs on the right hand of the road, I think of Sergio and Silvia, two friends who had an accident in these roads last year. After crossing a small river we encounter two ladies. One of them is riding a small pony that walked with great difficulty, and the other one hauling the pony as if the poor animal did not carry a tremendous weight on his back. Perhaps she was afraid that the pony escaped downhill, making that his precious load fell on the ground. Following the two ladies walks a kid of about twelve years, surely to make the pony return. They raise their arms as they see, asking us to stop. – Ladies, good afternoon, where are you heading? – We are leaving to Cusco, “ingeniero”. Can you bring us close to the main road? – Yes sure. What are you going to do in Cusco? – We are teachers in one of these communities. We have training in Cusco. – Training? … But, it is still Tuesday. – Yes, but we also have some arrangements to do in Cusco before the training. We are directors at the school; the rest of the teachers will travel tomorrow. – Oh, yes, I understand. Jump on the back of the pick-up. Commenting this happening, Silvio, the leader of the community of Uyllullo, adds: “they always do the same; in the past the teachers lived in the community the whole month. But now it is no longer like that. Our children are left behind, sometimes they don´t even want to go to the school”. Another villager, who has been silent the whole drive, adds: “the other day, they called to us to assembly of family parents. I attended in representation of my son, because he had to work in the ´chacra´. The teachers told us that they would be absent for a whole week. They had to send our children´s registrations to Lima, but internet was not working. Who is that internet, ingeniero, who does not want to receive the registration of our children? Because of that reason now the teachers have to be a whole week away and our children will have nobody to teach them”. In his glance and his words one can read the loss of hope, while he takes some coca leaves out of a plastic bag and begins to chew, as if in each coca leaf he found forces to fight the abandonment of his community. “But hopefully now with this project you will take care of our necessities, ingeniero, because my community has been left by all the authorities of our district and of our province. We are the forgotten ones”. Uyllullo, a forgotten community of 143 people that are only visited by the local authorities during electoral campaigns. 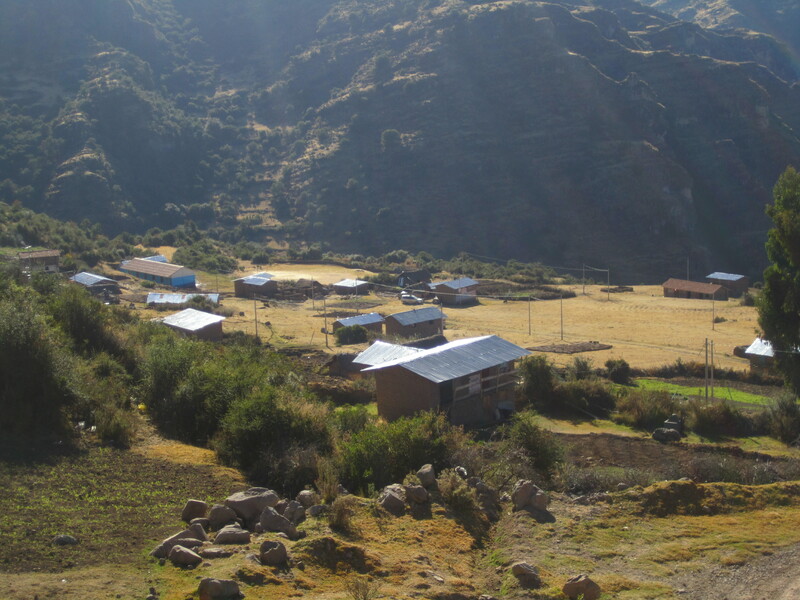 Uyllullo, a forgotten community of 143 people who are descendants of Spaniaards who decided to stay in Peru after the war that leaded to the Peruvian Independence. 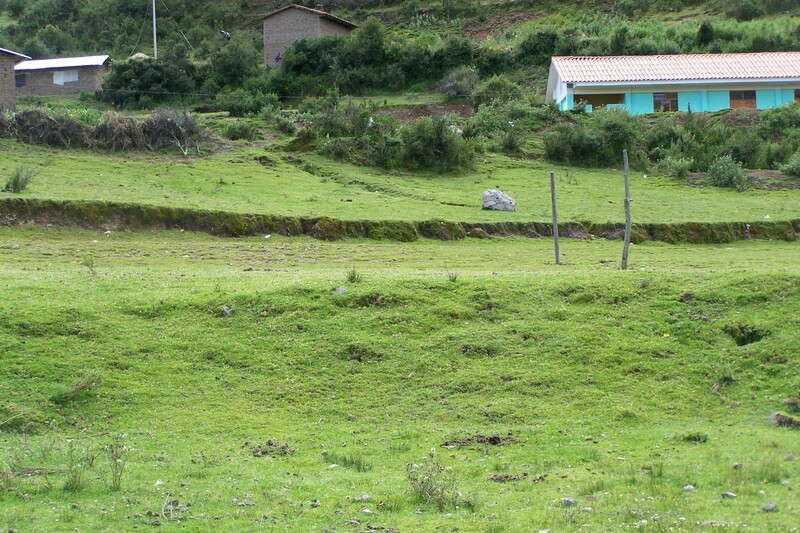 Qehuayllo, a forgotten community of 172 people with sometimes no teachers but with a soccer field since 2010. The construction of this soccer field destroyed part of the irrigation system that was installed months before. “Why?” I dare to ask. Nobody had asked them whether they wanted that irrigation system, and what the irrigation system should be used for. Nobody had planned to integrate it with the development of new crops of vegetables. 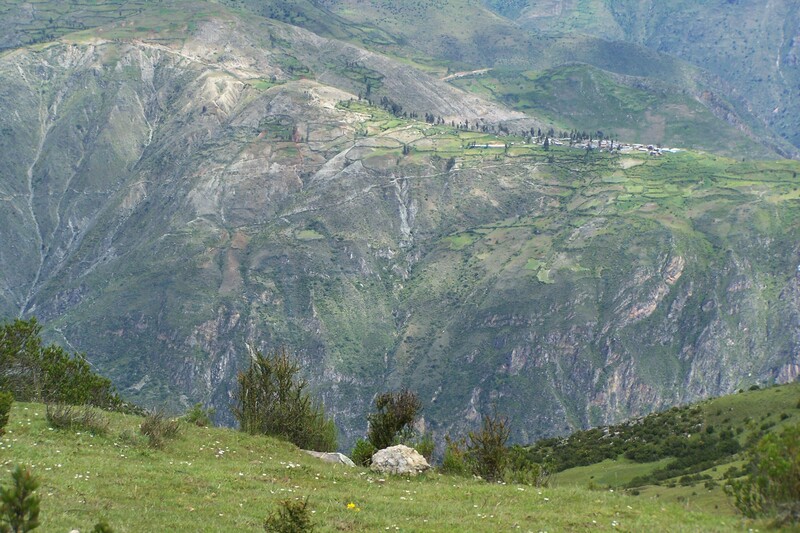 Uyllullo and Qehuayllo, forgotten communities, soccer fields in exchange of votes. Uyllullo and Qehuayllo now have the enthusiasm of their young leaders, who promise to work together with the objective to come out ahead, to become a strong organization, to work in a united form, recovering their traditional “ayni”, their customs, their celebrations, their traditions. 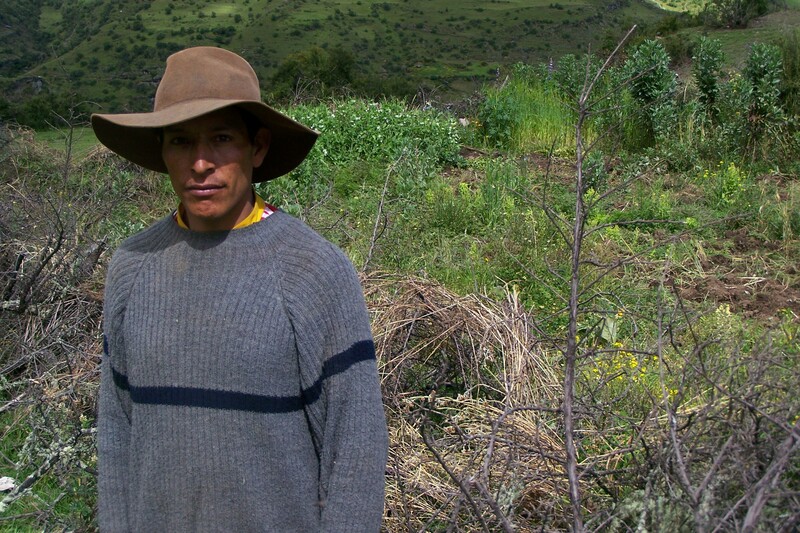 Uyllullo and Qehuayllo, no teachers, but new irrigation systems, new crops to feed their children and soccer field where we may gather to celebrate a new future. Based on the original text Virgilio Paredes Ccasani, Agrarian technician of Chakana Perú. Lao athletes to the Arafura Games? After the completion of the games in 2009 in Vientiane, support for sports development in Lao has practically ground to a halt. Internationally funded coaches (both Lao and foreign) that previously provided structured programs for Lao athletes training for the games have returned to their home countries or stopped coaching due to the discontinuation of funding. Sports facilities built for the games have also started to deteriorate as maintenance costs can no longer be met. As a result several athletes who were able to compete at an elite level at the SEA Games are now in a state of limbo, with no facilities, coaches or competitions and hence little motivation to continue pursuing their sporting dreams. 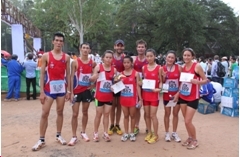 However, the Laos’ Middle Distance Athletic Squad is an extremely dedicated group of athletes. The squad consists of 4 girls and 6 boys. Disciplines range from 800m to 10km. All 10 athletes are aged in between 15 and 24 years. Despite limited facilities and the few competitions in own country, all athletes have continued training a minimum of 5 times a week, with some training up to 8 times a week. I began voluntarily working with the Lao athletes after the completion of the SEA Games. Besides the coaching of these athletes, I started together with Emma to look for sponsors to take the squad to the Angkor Wat International Half Marathon which was held in Cambodia on December 5th, 2010. After raising more than $4000, 7 athletes traveled to Cambodia. The experience was a phenomenal success. The Arafura Games is the leading international sporting competition for emerging athletes from the Asia Pacific region. Held every two years in Darwin, the capital of Australia’s Northern Territory, the Arafura Games features many different sporting disciplines including athletics. The event is as much about cultural integration as the sports themselves, with the games being billed as a ‘meeting of sporting neighbors’. The next Arafura Games will be held between 7-14 May of 2011. It is a great opportunity for some of the athletes of the Lao squad to continue fulfilling their sportive ambitions and become leading sports ambassadors of their country. Therefore Emma and I are looking again for donors to allow for 6 athletes to participate in the Arafura Games. Two athletes are expected to participate in the 5.000 meters race, another two will race the 800 meters and the remaining two will represent Laos in the half marathon. Expected costs to take 6 athletes to the Arafura Games are 3000 US$ (6 athletes a 500 US$ per athlete). The management of the donations will be done by INGO Village Focus International. 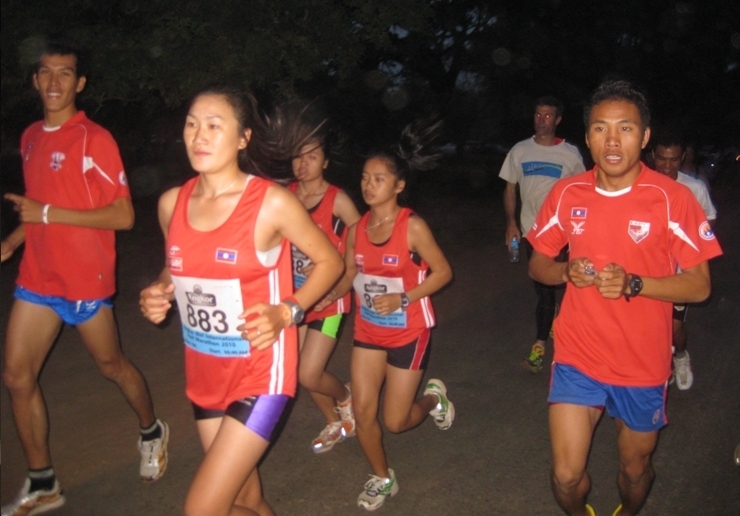 And now: would you like to support Lao Athletes to compete at the Arafura Games? When Ya (19) and Souk (19) travelled to Siem Reap last Friday they had no intention of winning the 15th Angkor Wat International 10 Km running race. But after running 32’12” and 38’26” respectively, they did not only win one of the most popular races in the South Asian running calendar, they also set new course records in both the men and the women category. 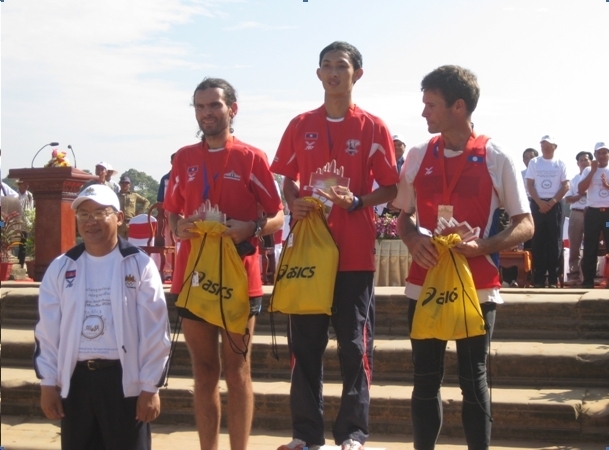 Starting at 6.40 AM last Sunday 5 December 2010 in front of Angkor Wat temple, both Lao runners dominated their respective races in a course that offers fantastic views of historical temples and lush jungle. Souk’s victory is a new 10 Km national record and provides additional motivation during her preparation for the upcoming SEA student Games in Chiang Mai, where she will represent Lao PDR in the Womens 1500m. Toly (15) accompanied Souk on the podium after she ran in 40’17”, to finish 3rd. Toly is the current national champion in the 800 meters. In this same race Khout (15) and Souvanhy (15) ended impressively to come 5th and 7th respectively. Ya, who represented Laos last year during the SEA Games in Vientiane, and about whom I wrote some posts ago, improved his personal best by more than 2 minutes in Angkor Wat International 10 Km. In the same race Tom (23) ran 34’15”, taking him to the 4th position. In the half marathon race Seng (24), who holds the national record in the marathon (and about whom I already wrote in a previous post) had injury concerns after the 14th Km when he was still running in the 4th position. Despite the problems during the race, and a difficult preparation towards Angkor (Seng suffered from Malaria – thanks doctor Cecile for your help), Seng ran the half marathon in a strong 1h. 25’. The team was accompanied by Emma a group of expatriate running enthusiasts living in Vientiane who offered considerable financial support to the athletes and myself. Financial assistance was also provided by Joma, The Laos Elephants Football Club and Athletics Essendon (an Australian Athletics Club). All runners of the Lao middle and long distance squad will participate in the Lao-Singapore Charity Run, which will be held next Saturday in Vientiane. This race is the only opportunity that these runners have this year to compete in a road race in their own country. This forces them to look for competitions overseas to keep developing their sport careers. Last week I traveled with 8 athletes from the Laos athletics team to the King’s Cup Thailand National Track and Field Championships in Bangkok. I was accompanied by Emma Zalcman and Chalensouk AOUDOMPHANH (Jiab). Emma moved to Laos to volunteer as a veterinarian for ElefantAsia, a French NGO which offers free veterinary care to domesticated elephants. Keen to continue training (when she wasn’t busy with elephants! ), Emma quickly became involved in athletics in Lao PDR; joining the Laos Middle Distance squad shortly after her arrival. Jiab is currently the sprinters’ coach of the squad and, among other events, has also represented Lao PDR at the Olympic Games of Athens. The championships were at Thammasat University and against strong teams from over 8 countries within Asia. 19 year old, Souksavanh Makivan posted a personal best time of 5.07 minutes in the Junior Women’s 1500m to win bronze. She then went on to win the 5000 meters in a time of 20.01 minutes. 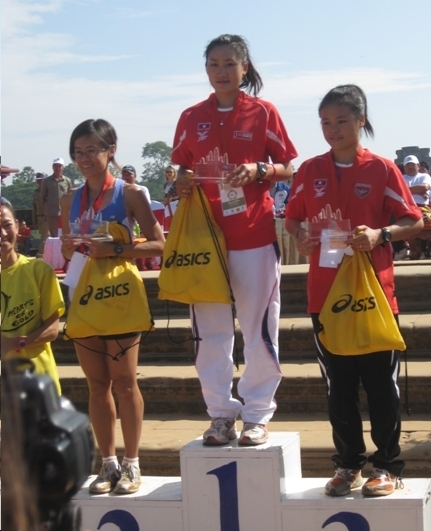 Souksavanh competed in the 2009 SEA Games and will compete in the ASEAN Student Games in Chang Mai next December as well at the Angkor 10Km, also in December. Two other athletes made the Junior Womens 800m final. Competing against athletes far older than them, Koud Keo and Toly (both 15 years old) posted personal best times (2.30.01 and 2.34.10 respectively) to earn their place in the final. Both athletes made significant improvements on their former personal bests which were run at the SEA Games in 2009. Laos was also well represented in the junior mens events. After a too fast start (9.45 after 3000 meters) Sysavath finished 7th in the 5000 m with a time of 17.30 minutes. Bountom Glorkham completed his third the 1500m ever in 4.35 minutes.